Remarks: Relocation express bus services from Medan Gopeng Bus Terminial to aman Jaya Bus Terminal effective from Apr 2013. 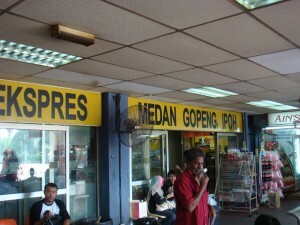 Medan Gopeng was Ipoh’s main bus terminal. It is conveniently located at Medan Gopeng in Ipoh city centre, along the Jalan Raja Dr. Nazrin Shah. 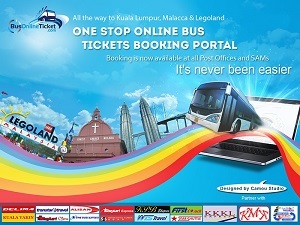 The best way to get to Medan Gopeng bus temrinal is by intercity bus or taxi. To ease the city traffic congestion, express bus has been relocated to Aman Jaya bus Terminal effective from Apr 2013. Medan Gopeng Ipoh Bus Terminal serves the outbound routes of to most places in Malaysia, and the most common routes are Ipoh to Kuala Lumpur, Ipoh to LCCT, Ipoh to KLIA, Ipoh to Cameron Highland and Ipoh to Penang. Besides that Medan Gopeng Ipoh Bus Terminal also serves as the inbound terminal for Kuala Lumpur to Ipoh, Penang to Ipoh, LCCT to Ipoh, KLIA to Ipoh and Cameron Highland to Ipoh.